Today’s topic is one I think will be super helpful for all of you, but especially for those of you who aren’t “techy”, but still need ways to share your content. I have an unnatural fear of the word C-panel, but the plugin we are talking about today was easy for me to install and I have been testing it for the past few months. It is true that certain technical items can help you share more of your content on Pinterest, and the plug-in Social Warfare is one of those things that can make a huge difference. Installation and use have been so easy with this plugin that I knew I wanted to share it with you all. So I have asked one of the founders, Dustin Stout, to join me today to talk about this plugin and how it can help you. Dustin began blogging seriously in 2011, after dabbling for a couple of years. He took the mix of his extroverted personality and his love of all things technology, and dove into the designing and developing world. While building websites on WordPress for clients, Dustin began to see how poorly developed most social sharing plugins for WordPress were. So he called a couple of friends, who happened to be geniuses at developing, and they worked on solving their own problems with share plugins. Once the product was complete, they started to spread the word about it and found that other people were just as frustrated as they had been, and it was only then that they realized this new plugin could be a product that they could actually sell. Plugins are notorious for slowing down your page loading speed; not to mention all of the technical difficulties that can go along with them. Things may not work the way they should; they might not line up correctly; they might pull the wrong image for your Pinterest share; maybe they don’t hide the image you want hidden…so many things can go wrong. Dustin and his team are committed to taking something that is very complicated, like a plugin, and make it simple enough for the average blogger to use easily. Dustin will eventually be putting out a comprehensive guide to using Social Warfare plugin, but in the meantime, here are his top strategies that he uses with his consulting clients. Only use 3-5 sharing buttons…the less the better. (Be sure to listen to the full episode to hear the fascinating market research behind “the paradox of choice”.) People may think they want more options, but they actually don’t choose anything when there are more options. Use your Google analytics to see which social media sites are your top 3 traffic referrals and use buttons for those sites only. Place share buttons at the top of your article if you have a lot of social shares. The number of shares on your content encourages others to share it. (Again, listen in as Dustin talks about the concept of “social proof.”) With the Social Warfare plugin, you can set a bare minimum number for social shares before allowing it to list that number; low sharing numbers can actually discourage people from sharing. If you don’t have a lot of shares, then only place your share buttons at the bottom of posts, or floating as the reader pages down. Big question for Ahalogy users – Does the Ahalogy link affect share counts? Nope and here’s a way to tell! Hidden Pinterest Image – this is very helpful for those blog posts where you don’t want to use a Pinterest-driven tall image. After doing this for 1 year, Dustin has seen his Pinterest traffic go from 3% of his web traffic to 45%!! FREE version of the new 2.0 – this is a slimmed down version of the premium one. Popular posts widget – this widget sorts your posts based on social shares, instead of the default WordPress sorting by number of comments. Pinterest button on image hover. This allows you to have the Pinterest share button pop up when you hover over any images you select. Perfect for food bloggers who have many optimized images in their posts. Only available for desktop. The Premium version of Social Warfare, which includes all of the wonderful new options Dustin talks about in the episode, along with full technical support, is $29 per year. This is the one I use and I have been so thrilled with it. Totally worth it! My conversation with Dustin was so helpful to me personally that I wanted to share with you the action steps I took away from it for my own personal site. One final tip – Dustin has loads of helpful blogging information on his site. Here is a link to his Blogging Series, which contains enough information on blogging to keep you busy for a very long time! 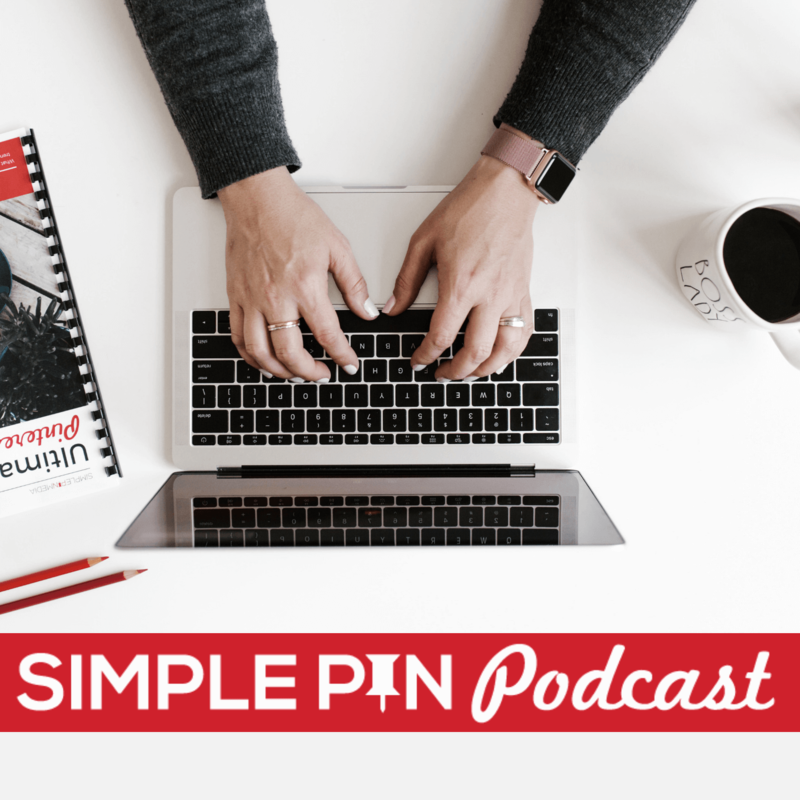 Listen to more Simple Pin podcast episodes here. First of all, I find your content AMAZINGLY helpful and I love your podcast!! Here is a question for you (or Dustin). I know this post is a bit older but I have been spending hours trying to find info on the web to understand this and I am stumped. I am going back through my posts trying to make better Pin-worthy images. I have been using Social Warfare Pro for most of my blog posts (I’m a newbie with only about 30ish posts). However, if I want to change the image that I uploaded to the Social Warfare plugin on a particular post, I have to delete the old image because you can only upload one. BUT, I know you are not supposed to delete pins! Or maybe I don’t understand this all the way I should. I’m assuming if I delete the old image from SW then I will be breaking all the links to any pins associated with that image?? I feel like my head is going to explode with all these Pin questions!! Thanks in advance for any advice! It won’t break old pin in SW at all so you can go ahead and replace it. I do that al the time. You won’t break pin links.